Located at the busy intersection of Hillside Street and Central Avenue in Wichita, the hospital takes up nearly two city blocks, and includes an emergency room and Children’s Hospital on its campus. 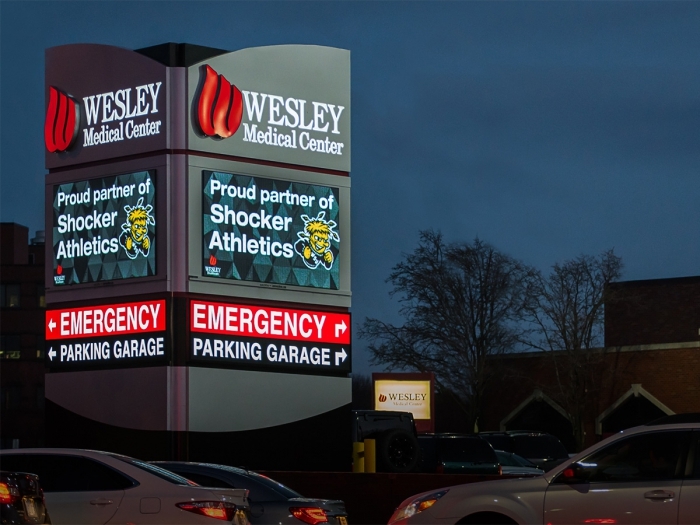 When they sought to create a place-making sign that would allow the health system to communicate important messages to the community, Wesley turned to the Wichita office of Luminous Neon Art & Sign Systems, one of seven locations for the company. Luminous designed a three-sided monument, each side with a large digital message center, along with a full-size door for walk-in service access. The hospital is using the message centers to broadcast health reminders, as well as classes and programs available at the hospital. Using an RSS feed, wait times for the ER are also broadcast. “This is a busy intersection in an area that is heavily traveled, so having the flexibility to run informative messages really helps us to get important news out to the community,” said Allen Poston, vice president of marketing and public relations for Wesley Healthcare. Shortly after turning on their new sign, Poston learned how important this flexibility would be. The city had to close the entrance to the ER to do infrastructure work, and cars needed to be re-routed. Poston’s staff was able to quickly remove all messages from the message center and replace them with a directional message to the ER’s alternate entrance.